We received some interesting, and some not very effective direct mail earlier this year (recently resurfaced on our desks). I’d like to share the high points … and the low. Starting with the high: We received our monthly post card from the Realtor ™ that sold our house in Los Angeles. It had Valentine’s Day artwork on the front with a story on the back. It was not a heavy sales pitch, it was just keeping in touch. Here is why this is the high point. Jim Ezell has kept us on his mailing list, even though we left his prime geographic area. Why? Because Jim is an incredible agent and HE knows how many people we still know in the San Fernando Valley. This is a reminder that even if you JUST did business with someone, or did business a year ago and probably won't do business again for awhile, it pays to stay in touch. Let’s talk about the other mail. There were two pieces in this other side. They were both from a credit card company and airline that we have frequent flier mileage from. Lots of mileage. 2 million miles worth. Those two million miles are enough to gain access to the airline’s first class lounges whenever we are in the airport. Their lounges are actually pretty awesome – if it weren’t for the fact that they were on the other side of that security check, we would go there all the time. The first piece of mail had one of those fake membership cards that don’t really do anything. It was simply symbolic that we had reached a level of recognition from the company. They were just announcing themselves without really giving us anything. It was very curious that the second piece of mail had a call to action on the envelope that offered us two 1-day passes to the same club we to which we’ve already been given a membership. This means that the offer was lost on us. It was not effective direct mail. The message here is that you need to watch the segmentation of your mailing list – both for direct mail and email. You have to keep your offers straight and that is the only way to do that. When it comes to offers, it should be incredible. You must make it effective direct mail. Think what would make YOU, call YOU and then go just a smidge further. You can test the offer by asking some potential clients if that would “work on them.” I have found that people I know from the Chamber of Commerce that I see all the time, know a little bit about and are pretty certain that they are not targeting me as a vendor are great for this purpose. In this case, the offer that the bank and airlines sent us would have been great if we had JUST been in the lounge on a ‘guest pass.' For example, you are allowed into that lounge if you are traveling First Class on an international flight even if you are not a member of the club. 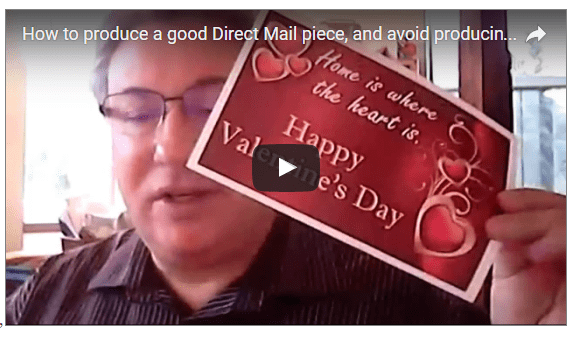 Direct mail is a great way to generate business – but you have to do it right. Want some help? Give us a call, or send us a letter! The number is 800-705-4265, the email address is Info@YuloffCreative.com and our mailing address is 2370 West State Route 89A #11-447, Sedona, AZ 86336. Oh, and one last tip – don’t forget to attach the right stamps!